Can't find what you need ? Contact us, We're happy to help. This product is not sold individually. You must select a quantity of at least 1 to order this product. Helps create a watertight seal along the roof edges, around air vents, vent pipes, air conditioners and screw heads. Compatible with EPDM sheeting, it offers excellent adhesion to aluminum, mortar, wood, vinyl, galvanized metal and concrete. It improves the ability to continuously seal and remain flexible. UV stabilized to prevent deterioration and discoloration. Will not stain or discolor any material to which it is applied. 10.3 oz. tubes. Malcolm M. on 19/11/2017 I ordered everything to re cover the roof on my 28’ Terry fifth wheel from rv partshop , great to deal with, very happy with the service and help ordering the parts I need , thanks! 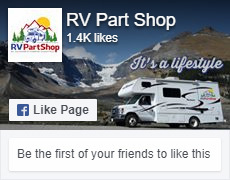 RV Part Shop is Canada's own RV Parts and Accessories leader. Fast Domestic shipping without any border hassles makes us the supplier of choice for thousands for Canadian RV, Motorhome & Travel Trailer owners and outdoor enthusiasts. In-Stock Items ship every business day from RV warehouse distribution centres in Ontario and Alberta, allowing us to get your products to your home or campsite anywhere in the country in the shortest time and with the best service possible. Orders for US RV owners (or Canadian snowbirds at US RV Vacation Spots) are distributed quickly and efficiently via UPS from one of seven national warehouses located strategically across the USA. These distribution centers house and inventory of millions of RV parts and accessories and outdoor lifestyle products. This allows our US-based customers to get exceptional service, pay no border fees and receive their purchases fast. © 2018 RV Parts & Accessories For Sale Online - RV Part Shop Canada. All Rights Reserved.